Considering the changes that have taken place in soul and funk music, Jean Paul “Bluey” Maunick and the vocalists and musicians of the group Incognito have plenty of reasons to celebrate their 35 years of making music. Incognito emerged during an era when self-contained bands were as much the rule as the solo vocalist, and they’ve survived and thrived into this present age that is driven by singers, rappers and producers who deploy technology. 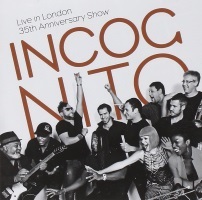 So Incognito’s 35th anniversary concert held this past July in London allowed the band, along with Incognito fans, to take a measure of the original tunes and covers that helped to cement the signature sound that has been a crucial part of the soundtrack for funk, soul and acid jazz fans since 1979. The album’s highlights included the cover of Stevie Wonder’s “As” that the group reimagined by given the tune a slightly faster paced tempo, as well as a funky rendition of the Ronnie Laws’ instrumental classic “Always There” that features a spacey keyboard solo and lyrics for a song that – judging from audience a reaction – has become a favorite since it appeared on Inside Life back in 1991. The surprise highlight of the concert was the energetic performance of Mario Biondi’s “This Is What You Are” with Biondi brining his distinctive vocals to the stage for a cameo appearance where he engaged the audience in call and response. Bluey has kept Incognito together and vibrant by employing an open door and open ended management style. Those the comings and goings can be dizzying, but they also have the virtue of keeping the band’s sound fresh and Live in London shows that what’s worked for 35 years in the studio easily transfers to the stage. It is a terrific updated look at a now legendary band. Recommended.